The first thing that pops into my head when I think of Virgina - a state I had previously never visited - is power hungry, talk-out-of-both-sides-of-their-mouths politicians; or at least that was the case. Now I've had a chance to visit, it turns out that they have some pretty awesome forests and mountains too. 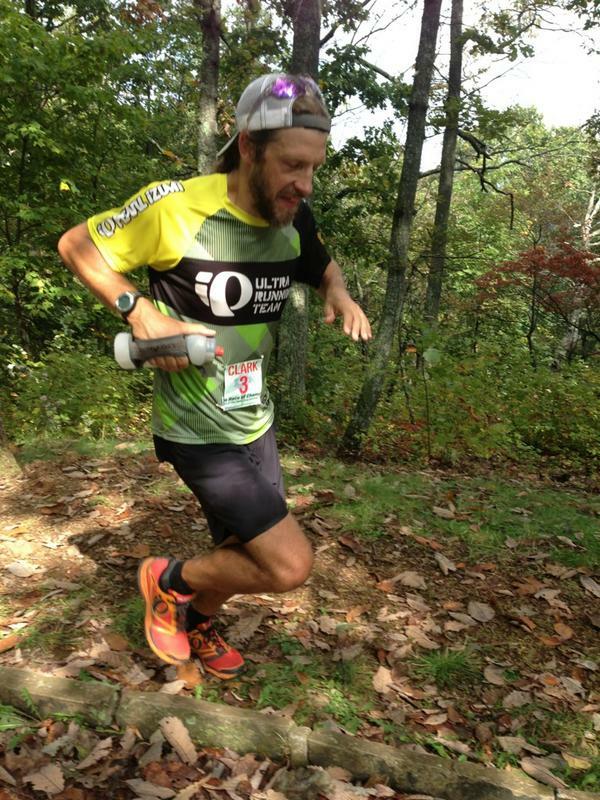 The Ultra Race of Champions (or UROC) offers beautiful vistas of the densely forested Blue Ridge Mountains, which while lower than their Rocky Mountain nephews are certainly no less intimidating from a vertical-relief standpoint. There's some good climbing to be done out east, people. The journey out to Charlottesville was punctuated by thunderstorms, late flights and two hours of sitting in a stationary plane waiting to take off for a 20-minute commuter flight. Nonetheless, I finally arrived at Wintergreen Resort - nestled high in the Blue Ridge Mountains - at 2:30 a.m on Friday morning with a motley crew of travel companions (Ellie Greenwood, Scott Jaime and Jorge Maravilla) and the most wonderful chauffeur ever, Ms. Rosemary. Friday brought rains, but you'd never have known the next day. Things apparently drain a whole lot better in the Blue Ridge Mountains than they do on the Front Range, so I decided to stick with the Kissaki 2.0, my go-to Pearl Izumi light weight road shoe. 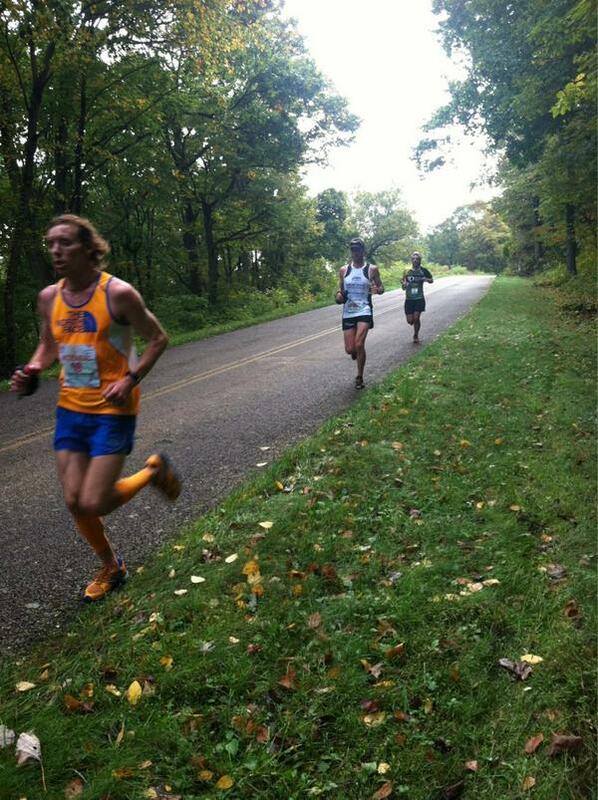 The field in the men's event was a strong one, packed with fast ultrarunners and faster marathoners. Given the number of road miles we'd have to cover, I wasn't much liking my chances, but I had to keep reminding myself that it was still 62 miles and that with patience anything was possible. From the gun, there was a quick section of road before we hit a 2,000 foot drop on a pretty rocky, loose and somewhat slippery section of double track trail. We descended en masse through the thick canopy, barely able to make out our next footfalls in the early morning light. The pace felt unnecessarily hot, but that was to be expected given the pack dynamics, the overabundance of testosterone, and the early hour. The climb back out created some gaps, and by the time we topped out back in the Wintergreen Resort, I was running with David Riddle and a fast-looking Ethiopian guy. We continued to hammer any and all descents and I was starting to shake my head at my stupidity, but of course continued to run with it. No more than eight miles into the race, our Ethiopian companion decided that he'd had enough and caught a lift from a passing car. That left me and Dave chasing Dave Mackey and (we thought) Sage Canaday and Max King. Turns out that Sage and Max took a wrong turn somewhere on the road and that in fact Riddle and I were running in second and third. After the 10-mile, king of the hill aid station there was a rip-roaring descent out of the sprawling Wintergreen Resort towards the Blue Ridge Parkway. I decided then that it was time to let David go, and I watched him quickly gap me as I slotted into a pace that I figured would be a little less destructive on my quads - although my legs were already telling me that it might have been an idea to consider that option a little earlier. What followed was a long and somewhat tedious section of road running. Yes the views were outstanding, but there was no getting away from the fact that we were pounding some serious road mileage. I could see the two Daves in the lead up ahead as we progressed along the Parkway, and I picked up my pace to hang with Jordan McDougal and David LePorho as they caught up to me. Not long thereafter, Max and Sage bridged the gap, and I upped the pace one more time, before deciding that the wise move here was to find my own rhythm and forget about the rest of the field. I came into the mile 20 aid station a few ticks behind Jordan and David, while Sage and Max were just making their way out. I got out before Daivd and just after Jordan. Thirty seconds later, I went by Jordan who was off the side of the trail losing his stomach. Bummer for him, but he assured me it was standard-operating procedure. Jordan, David and myself coming into the 20 mile aid. All photos: IRunFar Media. Rather than energize me, the trail actually zapped me a bit. After a half marathon of road running, I was having a hard time transitioning back to technical trail. My legs were tired and they really didn't want to be dealing with any kind of lateral motion. David went by me quickly, and a couple of miles further down the trail, Jorge did the same. And then we were back on the Parkway for another eight miles of pounding. Sharman went by me here, and while I wasn't totally falling apart, I could tell that the guys in front of me were hungry and moving well. They were present in the race, whereas I was trying my hardest to take my mind to a different place. I spent a lot of time thinking about my kids and the off season. Finally, I got to the aid station for the four mile out and back section on the Dragon's Back trail. I had begun to settle in and I at least knew now that I would complete the race, if not set it on fire. I had come to terms with the fact that my only chance of getting into the top five would be by plugging along in my one gear in hopes that some of the guys in front of me blew up. The gaps were definitely still small enough and with 30 miles still left to run, anything was possible. I would need to catch three guys if I wanted to make the top five. Max was the first guy coming back on the trail and he was looking focused and moving really well. After seeing Sage a little worse for wear and a good four minutes back on Max, I was pretty certain Max would win. Riddle looked a bit out of it in third and Mackey didn't look a whole lot better. Le Porho and Jorge both looked impressive, while Ian seemed steady as ever. Sixth was starting to look like my best possible place. Mercifully, the trail section was super runnable and passed by very quickly. My legs were sore, I was feeling sluggish, but my stomach was in fine fettle which meant I had great energy. I knew that if nothing else, I was at least going to run every step of the course. Now at mile 40, we were down to nothing more than a long training run - equivalent in terrain and relief to a lap of Horsetooth Reservoir back home. Popping back out 8 miles later. And back along the road I ran. Nobody behind and nobody ahead. 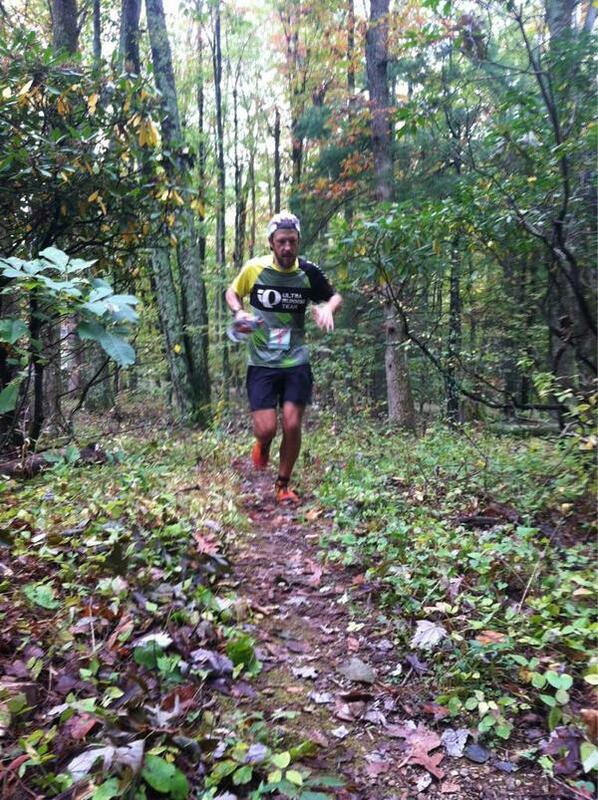 At the mile 48 aid station, I learned that Riddle had dropped and that Mackey was struggling, just a couple of minutes up on me, but that the rest of the field was a good 15-20 minutes up. If ever there was a racing no-man's-land, this was it. I was in seventh, likely to pick up sixth, but with very little chance of getting into the paying top five spots. And so it was. I plugged away, covered the miles, all the while getting repeated updates that Mackey was looking terrible just two minutes ahead. I think I caught sight of Dave once on the Parkway, but it wasn't until the last two-mile climb that I was finally able to lock on. As I caught up to Dave, I considered suggesting that we finish together, but he was moving too slow and I desperately wanted to be done. 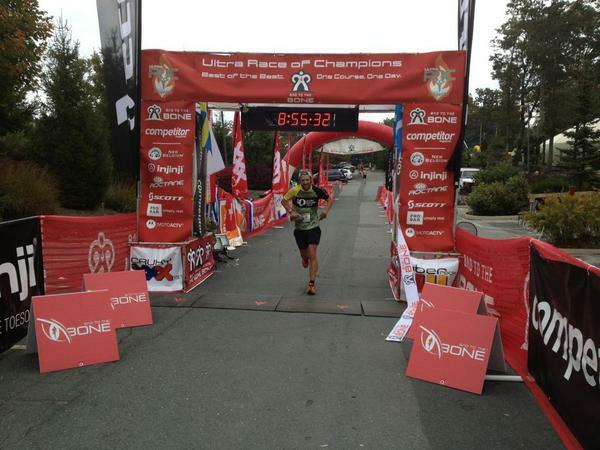 It was a great feeling to cross the finish line, as that particular finish line marks the end of my ultrarunning season. Right now, I'm looking forward to chopping my training mileage significantly, bumping up the quality in preparation for some fun on the roads, while also tagging a whole bunch of really random and obscure peaks in Larimer County with family and friends. The UROC event is a unique one, and quite unlike any other I have run. The course itself was a little road heavy to be considered a true hybrid, in my opinion. My best guess is that we ran 40 miles of road and 20 miles of true trail, a ratio that obviously favors the faster turnover guys. Next year, the race migrates to Colorado, where I would guess the mix will be flipped on its head. In addition, there will be the altitude variable - something that typically works in my favor. I like my chances a little better there. It was great to have the opportunity to run out east. I know it is a frustration for many ultrarunners based east of the Rockies that their courses get less love than those in the west, so I tip my hat to Fran and Gil for organizing this event and promoting such a stunning location. They really put on a first-class event; from the course marking, to the aid stations and to all the other little details that go into putting on event like this. My guess is that with the new Colorado location and buy-in from the host towns (Frisco, Breck, Vail), the UROC concept will go from strength to strength in the coming years. Did you drink any Yuengling while you were there? Sure did - courtesy of AJW. Also drank a couple of brews from Devils Backbone - a local brew pub - and then some other local brewery that I can't remember the name of. This is in addition to the post-race brew offerings from, ahem, New Belgium. A home away from home. Great read as always. Are you fancying a quick winter marathon time? A spring marathon might well be in the cards. I'll see how things go this fall/winter. I'd like to give sub-2:30 another shot, but I'll have to see if I'm getting into anywhere near that kind of shape after a month or two of more focused training. If no, then I probably won't bother. New Orleans in Feb would be the race, I think. Great to see you grid out another good result on a course that might not suit your strengths. You show, well, what a versatile athlete you are! Also glad to see UROC heading West for a few years. Hope when it comes back this way it comes to Asheville or the White Mtns in NH. Both venues would again offer a completely different race than what VA and CO offer. Great season Nick! Congratulations for a challenge concluded with praise, maybe one day I do not run this race with you. I sounds like a nice place to run that kind of race even though everything else doesn't sound compelling.